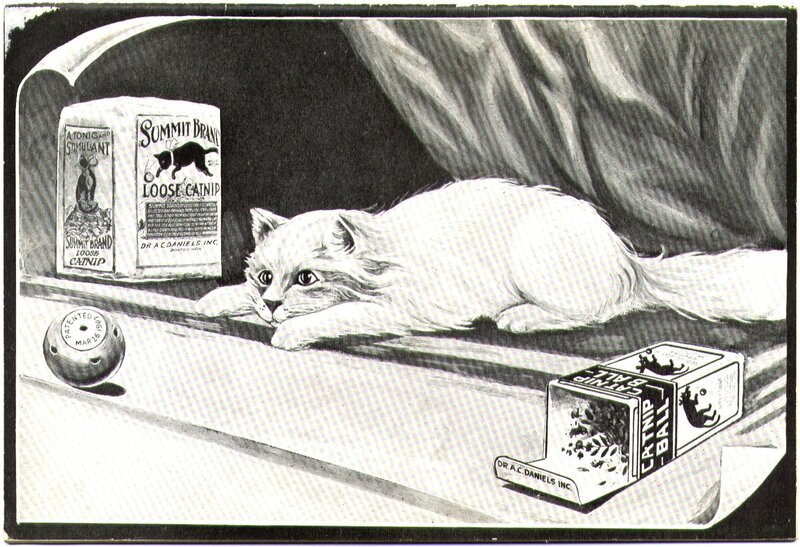 Now that catnip for people (recreational marijuana) is the topic of so much conversation, let’s think about why we get so much pleasure from helping our cats get a wicked buzz from a plant…. Catnip (botanical name, nepeta cataria) is native to Europe, where it has long been used as herbal medicine. Its usefulness for treating fevers, sleeplessness, body aches and particularly digestive troubles is what inspired its cultivation in North American gardens. A member of the mint family, it has now escaped from gardens and can be found growing along roadsides and in abandoned house sites. There are two current members of my household, Ruby and Alfredo, who are very grateful that I grow catnip in my garden. I like it because the flowers attract a lot of bees, and the scent of the leaves is pleasant. I try different ways to protect the young plants when I put them into the herb bed — milk crates turned upside down, small tomato cages, and raising the plants off the ground in pots, but nothing can fully protect them from hot kitty love except rapid growth. 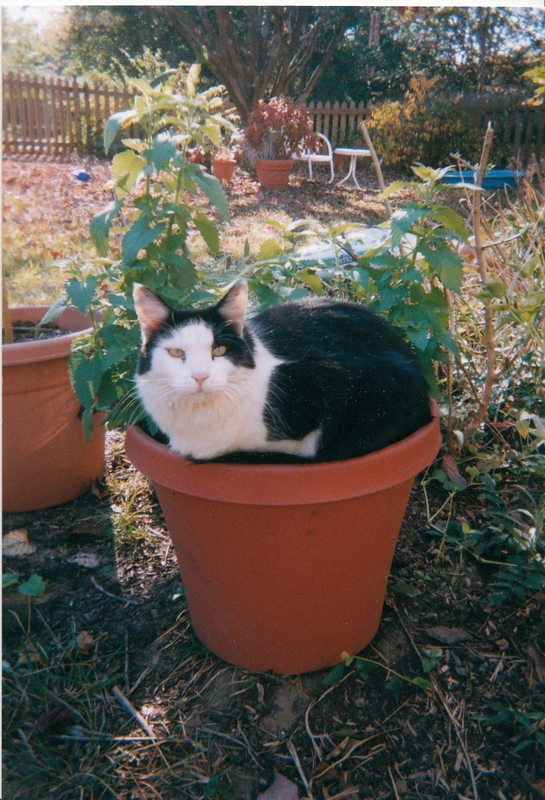 (Here is a snapshop of a youthful Ed, who passed away a few years ago after a long and happy life, sitting in a pot of catnip.) My stubby-tailed former barn cat Ruby likes to roll around on the plants with waving paws — and claws out — with eyes as big as saucers. I can’t weed near her or she’ll take a swipe at me! She soon dozes off, however. Now that I think on it, catnip and marijuana do have similar stupifying effects, with sleepiness the usual outcome of ingestion following a period of euphoria. In my next post on catnip. I’ll talk about the invention of the catnip mouse.